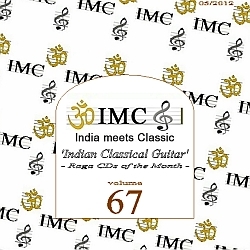 The promotion initiative IMC – India meets Classic presents the show “Raga CDs of the Month” with the new topic “From Hawaii to South Asia – The Indian Classical Guitar“. With the IMC programme in recent years (2006-2012) for Indian classical music we experienced instruments that come from the West ( see http://www.imcradio.net/archives ). Like the violin in the South Indian classical music, the hand-operated harmonium as an accompanying instrument and successor of the Sarangi (Indian fiddle) or the saxophone, as we know it from Jazz and the mandolin, a double-string instrument from Italy. There are many reasons that explain the arrival of Western instruments in the collective of traditional Indian wind, string and percussion instruments. There existed the military orchestras of the British Empire, French missionaries in the 19th century, the chapels of the Maharajas or film scores from Mumbai as the Bollywood capital. The sound of these new instruments inspired musicians to experiment. With structural changes and special playing techniques they adapted to the particular interpretations and Indian style of Ragas and Ragams (North and South Indian classics). The so called slide bar defines the height of the guitar tone by sliding on the free-swinging strings a lot more using a piece of iron, rather than to shorten or to extend by tapping the frets (on the guitar keyboard). Beside their own creations of slide bars there are various forms, materials and colours on the market. Until the 80s manufacturers experimented with new materials. Glas or pyrex, inorganic cobalt oxid, bone or porcelain can produce different timbres of sound. History conveys that in 1931 a young Hawaiians came to India with his guitar in the luggage. Tau Moe was his name. 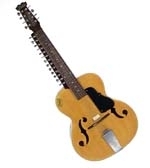 The importance of Tau Moe for the Indian slide guitar made him well known in India, more as in his homeland. First musicians in Indian West Bengal played songs on the Hawaiian guitar, performing compositions from the repertoire of the first Indian Nobel laureate Tagore Rabindranat (Rec. : With these lyrics and melodies of Tagore a separate vocal genre developed as ‘Rabindra Sangeet’). In addition to introducing the Hawaiian guitar and playing techniques of by Tao Moe there exist another version of narration. It is said that Gabriel Davion introduced in India to play the guitar with a steel bar. Gabriel Davion was a sailor of Indian descent. He was allegedly abducted by Portuguese sailors in 1876 to Hawaii. 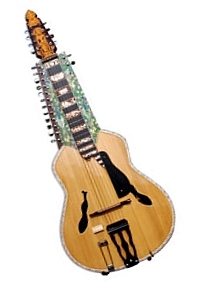 Gabriel Davion had oriented himself probably to the slide technique of the Vichitra Vina and Gotuvadyam, two Indian instruments (lutes). Since the 11th century the slide technique is known in India. This entry was posted on June 17, 2012 at 5:26 pm	and is filed under ENG (English), IMC OnAir - News. You can follow any responses to this entry through the RSS 2.0 feed. You can leave a response, or trackback from your own site.